FC Bayern München stand proud among Europe’s finest football teams with fan clubs and supporters all around the world, but the club had started with humble beginnings back in February 1900 as a breakaway group of Männer-Turn-Verein München von 1879, a Munich-based gymnastics club. With MTV 1879’s footballers barred from joining the fledgling German Football Association, a breakaway group eleven led by player Franz John would form FC Bayern München e.V. on 27th February. The newly-formed side started in the local league with a degree of success, and won the newly-founded Kreisliga in 1911 before the First World War brought a halt to proceedings. 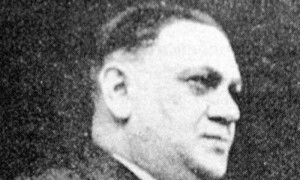 However between the wars the club improved rapidly under the stewardship of Kurt Landauer, who guided FC Bayern to the South German championship in 1926 before taking them to a maiden national triumph in 1932: the club’s only title before the professional era of the postwar Bundesliga. Bayern’s successful rise was stemmed by the rise of the Nazi regime in the early 1930s, which would in turn hasten the gradual decline of the club. Central to this was the long-serving president Landauer, who as a Jew was forced out of office in March 1933. Landauer was arrested in November 1938 and incarcerated at the concentration camp at Dachau just north of Munich, but his previous service as a soldier in the First World War allowed him to escape the fate of millions of others and seek exile in Switzerland. Without its guiding light at the helm, Bayern returned to the regional league. After more than six years in exile Landauer returned to Munich after the war as the club looked to recover, but these years were a struggle for the Munich club, then under the shadow of local rivals TSV 1860 München. Teetering on the brink of bankruptcy, Bayern were bailed out by local businessman Roland Endler – lighting the spark for the beginning of a renaissance. A first DFB-Pokal victory in 1956 was a welcome addition to the trophy cabinet, but Bayern would not be one of the clubs invited into the newly-formed Bundesliga in 1963 on account of the DFB only wanting one team from Munich in the new competition. That honour went to “TSV 1859”. Bayern eventually won promotion to the top flight in 1965, and by this time had started to develop a core of players that would soon change the face of football not just in the city of Munich but Germany and the world. Unknown at the time, one of the key moments took place in the suburb of Neubiberg in 1959 – when a fourteen year old 1859 fan playing for SC München 06 received what would be a fateful slap. Franz Beckenbauer’s dream was to play for the blue side of Munich, but on that day fate would throw him and his team against Turnsportverein. The now famous altercation with an opposition striker had ended with Beckenbauer turning his back on 1859 and heading to Bayern – where he would become a legend. Making their Bundesliga debut in the 1965-66 season, Bayern already had the aura of a top flight team by finishing in a creditable third place and securing a second DFB-Pokal. If there was a downside, the team that had won the championship would be none other than their local rivals 1859. Bayern retained the cup in 1967 and finished in sixth place, but more significantly had made their way onto the European stage with a 1-0 win over Glasgow Rangers in the final of the European Cup Winners’ Cup in Nürnberg. In 1969 the balance of power in Bavaria’s capital city had changed for good. While 1859 found themselves in tenth place, Bayern claimed the Bundesliga shield for the first time – their first national championship for thirty-seven years – and crown the season with another cup triumph and with it the first of many domestic doubles. With the likes of Beckenbauer, Gerd Müller and Sepp Maier in their ranks, it was the signal of the beginning of a new European footballing dynasty. The Bayern term of the early to mid 1970s under coach Udo Lattek has to rate as one of the finest teams in Bundesliga and arguably European history, and by now the trophy cabinet was quickly running out of room. 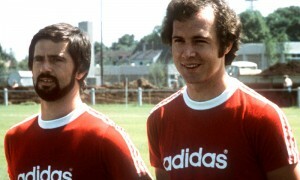 Two runners-up finishes in 1970 and 1971 were followed by three successive triumphs, but Bayern stamped their mark on European football with three successive European Cup triumphs between 1974 and 1976, emulating the feat of the great Ajax side that had dominated the previous three tournaments. Bayern’s maiden Champions’ Cup triumph came courtesy of a 4-0 replay win over Atletico Madrid after an arguably lucky 1-1 draw at the Heysel Stadium in Brussels with “Katsche” Schwarzenbeck scoring a dramatic equaliser in the final minute of extra time, and victories over English side Leeds United in 1975 and French Champions Saint Etienne 1976 completed a special hat-trick. The late 1970s and early 1980s saw the Beckenbauer/Müller/Maier axis make way for another talented generation epitomised by Paul Breitner and Karl-Heinz Rummenigge, dubbed by the German press as “Breitnigge”. Off the pitch a new era began, with the recently retired Uli Hoeneß being elected as club president, marking the beginning of a twenty-five year reign that finally transformed Bayern from a just another champion club into a stable European powerhouse. While the 1980s saw plenty of domestic success for Bayern under Dettmar Cramer and then Hungarians Gyula Lóránt and Pál Csernai, the club found itself continually plagued with bad luck on the European stage. There was the unlucky defeat at the hands of Aston Villa in the Champions’ Cup final in Rotterdam in 1982, and five years later in Vienna – with Lattek once again as coach – they looked set for a fourth Henkelpott before being dramatically overturned by a late show from unheralded FC Porto. Udo Lattek’s departure in 1987 made way for a young Jupp Heynckes, but with standards now being so high in Munich two further domestic triumphs would not be enough. The somewhat hasty removal of Heynckes in 1991 heralded another period of relative decline for Bayern, and the nadir would be reached in 1992 after Erich Ribbeck had taken over from the untried and untested Søren Lerby. The much publicised appointments of Italian Giovanni Trappatoni and long-time Werder Bremen coach Otto Rehhagel would end in disaster, but a return to the club as caretaker by Beckenbauer saw Bayern claim the UEFA Cup in 1996 – thus completing the set of three European trophies. Trappatoni returned to Munich for a slightly more successful spell between 1996 and 1998 – where he made even bigger headlines with infamous speech comparing certain players to empty bottles – but his departure in turn herald the beginning of another golden age in Bavaria. The appointment of Ottmar Hitzfeld – already a Champions’ League winning coach with Borussia Dortmund in 1997 – saw Bayern once again join the big boys on the world stage. There were moments of pain along the way, but the period between 1998 and 2004 would result in a new trophy cabinet being moved into the club’s headquarters at the Säbener Straße. With the man known as “der General” at the helm, Bayern collected four Bundesliga shields, two DFB-Pokal wins and – the biggest prize of all – the Champions’ League in 2001, ending a twenty-five year drought. The Champions’ League final in Milan could never be described as a classic in the traditional sense, but it was high on drama with the entire game focussed on the penalty spot. An early spot-kick gave Valencia the lead, and after Mehmet Scholl had missed from the spot in the first half, skipper Stefan Effenberg made no mistake when Bayern were awarded their second Elfmeter. Inevitably, the game worked its way to the end and through extra time to a penalty shootout, where “der Titan” Oliver Kahn emerged as the hero. The road to Champions’ League glory had been littered with bitter tears, but the long wait had finally come to an end. En route to that famous triumph in Milan had come the pain and agony of defeat at the hands of Manchester United in Barcelona in 1999 when Bayern would see a 1-0 lead turn into a 2-1 defeat in injury time, but that bitter blow would make victory two years later taste all the sweeter. After Hitzfeld’s departure in 2004 the domestic trophies continued to flood in, but after that fourth triumph in 2001 the big European trophy was to once again prove elusive. In the brand new Allianz Arena Felix Magath took the team to two domestic doubles in his first two seasons, but failure in Europe saw him go his own way. The great Hitzfeld made an unexpected return to Munich and add to his tally of domestic trophies, but as the end of the decade approached Bayern were still looking for the right formula. Former goalscoring hero Jürgen Klinsmann arrived in Munich to great press fanfare and acclaim, but he too was on his way before the end of his first season in charge. The beginning of the 2009/10 season however finally produced some of the green shoots of recovery. After a baptism of fire the outspoken, unorthodox yet highly effective Dutch coach Louis van Gaal had changed Bayern’s style of play and introduced a number of younger players into the team – and despite an inconsistent season Bayern finished just short of an unprecedented treble. Having claimed yet another domestic league and cup Bayern would make it to their eighth Champions’ Cup/League final, only to be suffocated by an effective Internazionale in Madrid. The defeat was as disappointing as any other, but for the first time Bayern had not been unlucky in defeat. Rather than dwell on the loss, it was the start of yet another great era in the history of the Munich club. Van Gaal departed somewhat acrimoniously at the end of the 2010/11 season, but the return of Jupp Heynckes – whose sacking twenty years earlier been long regretted by Bayern supremo Uli Hoeneß – would result in the greatest season in the club’s distinguished history. Of course, there could be no glory without the pain. Having been outmuscled by domestic rivals Borussia Dortmund in both the league and cup, Bayern had one big opportunity to end the season on a high – with victory on their home turf against Chelsea in the final of the Champions’ League – the “Finale dahoam”. Bayern dominated the game and had taken the lead eight minutes from time, only to drop their guard just six minutes later. The rest of the evening could have been scripted, with Robben missing a penalty in extra time and the team failing collectively from the spot in a nerve-shredding shootout. The three second-place finishes in 2012 provided the right measure of inspiration to drive the team onto bigger and better things the following season, and a dominant Bundesliga campaign resulted in a twenty-third Meisterschale. With the Pokalfinale to come in Berlin, Bayern faced domestic rivals Dortmund at Wembley in the final of the Champions’ League – Bayern’s tenth. It was a day where the ghosts of 2012 were exorcised, and where Robben – seen by many fans as the villain of the piece on 2012 – found his redemption. With the scores at 1-1 and the game heading inexorably into extra time, the Dutchman executed the perfect finish to outfox Dortmund ‘keeper Roman Weidenfeller to secure a fifth European title for Bayern. Less than a week later in Berlin, Heynckes’ side withstood a late comeback from outsiders VfB Stuttgart to complete an unprecedented treble. Having destroyed Europe’s finest en route to the final, this Bayern team were lauded as the successors to the great Barcelona team coached by Pep Guardiola – and to add that final cherry to the already rich cake the Catalan would arrive in Munich at the start of the 2013/14 season. Guardiola went on to take Bayern to yet another domestic double, but his first year in charge would be tainted just a little by the insipid semi-final defeat at the hands of Real Madrid – where for once the “Bestia Negra” were vanquished by the men in white. Off the pitch, everyone connected with Bayern were rocked by the court case involving the much-loved President Uli Hoeneß, who after a protracted trial was charged with tax evasion. Over the years Hoeneß had quite literally become part of the fabric at Bayern – for many, he simply was FC Bayern – and the verdict shook both players and fans alike. A man renowned for his frankness and big-hearted generosity, Hoeneß took it on the chin with honour, but another era had come to an end. FC Bayern was always going to be bigger than the man, even a larger than life figure like Hoeneß. With one of the most talented squads in Europe and the continent’s most highly-regarded coach at the helm, this Bayern side have been described by many as a team that can dominate once again dominate European football: it is time now for the team to deliver. One thing is certain. The Red Dragons London will be standing behind the club no matter where the road turns next. Weil wir in guten wie in schlechten Zeiten zueinander steh’n. You can find all of the key dates and personalities in the history of FC Bayern on our special map here, based on the style of the famous London Underground map. Just click the image below to view a larger on-screen version, and follow the ongoing historic journey of FC Bayern!